"First day, learn to prey. to help us with our needs. Jane Yolen's poem Kindergarten for Alligators is a terrific way to introduce poetry to your students, as a new school year begins. I wish I could convince every teacher to promise to make poetry an integral part of the reading experiences shared daily in their classrooms. It has such an impact on kids and their literacy, showing them how word choice and personally chosen subject matter can change their reading and writing lives. Poems make ideal mentor texts. They don't seem to grow old. They remain both fast and bold. probably at least two years old already. How old do you think he might be?" In backmatter, more gator facts are shared, as well as a glossary and a list of resources for those wanting to expand their knowledge. The ability to attend school is something we take for granted in North America. We may rarely consider how lucky we are to have that privilege. Our house faces the bus drop-off for our neighborhood school, and our kids had to walk half a block to the crosswalk that led them through the front door. We had our house built where it is because of the proximity to a school they would attend from kindergarten through sixth grade. We appreciated how lucky we were, and were aware that many of their friends had long bus rides to get to school each day. As the buses and cars arrive next week, and I hear the chatter of school children as they arrive to begin a new year, I will be thinking of the some of the children shown in this excellent book. Many children around the world are not afforded the opportunity to attend school. They have no access to roads, sidewalks, even paths to get them from home to the school. Or, they have no money and must work to help support their family. On the other hand, there are those who are so determined to attend that they use a variety of methods to ensure an education ... they are unusual, terrifying and successful. Rivers and mountains can get in the way. Narrow bridges offer little protection, as do narrow wires and bamboo poles. No matter the obstacles these children make their way, attending with happy excitement. The text is minimal and assure that the photographs (which will astound readers) have pride of place in a book that is sure to have us consider just how lucky we truly are. Each photo is accompanied by an unobtrusive label for the country represented. 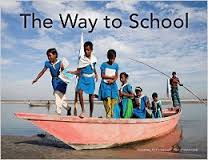 Whether it is by foot, boat, rope, ladder, zip-line, animal, wire, these children know the value of education and will go to any length to get one. Bravo! 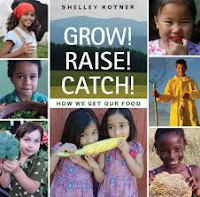 catch the fish ... "
As September rolls in, and the growing season for market gardeners and farmers begins to wind down, Shelley Rotner's newest work of nonfiction offers a clear picture for her young audience of just where our food originates. Young learners are often surprised to find that their food does not just come from the grocery stores where their parents shop. Rather, they learn it is grown, tended and harvested by an incredible group of dedicated farmers. On their farms they might specialize: some raise chickens that provide us with eggs and meat, some raise cattle that provide dairy products and many kinds of meat to satisfy our hunger, some raise vegetables of one kind or another, and often of many types, some tend bees that supply honey for our morning toast. It's important for each one of us to honor those people who make our lives better by providing the foods that sustain us and help our children grow strong and healthy. We can do that by supporting local farmers as often as possible. Ms. Rotner begins with archival photos that hearken back to earlier times when families grew, raised and caught their own food. Today, most purchase their food from grocery stores; although there is a growing trend to buy from farmer's markets. A double page spread filled with images of the farmers and fishers leads to an introduction for each of type of grower: vegetables, berries, citrus and fruit, wheat, rice, potato, corn, dairy, beef, chicken, pig, fish, shellfish and lobster. She concludes with a visit to a family farm. "We have a FAMILY FARM. We raise chickens for eggs and meat and goats for milk. We also grow our own vegetables and fruits. We raise bees and get honey from the hives. We tap the sap from our maple trees to make maple syrup. We make jelly from our grapes. We get sunflower seeds from our sunflowers. We like to know where our food comes from. We compost our leftover scraps of food by putting them back into the soil to make the soil healthier and more fertile. Then our food and animals will be healthier, too." The engaging color photos are plentiful, and are sure to help children understand the value we place on farmers for the very important work they do. They might even convince a family to give a small patio garden a try. A glossary and 'Did You Know?' section add to the appeal. But now, all that is gone. had to eat something, after all." Those of us lucky enough to have grandparents with stories to tell can learn much about the way things 'used to be'. I know because I am a grandparent, and I have some of those stories to tell as well. Every time my daughter comes home for a visit, we find ourselves driving around the city where she grew up, and talking about how many changes have happened since her last visit. We remember stories and events from her childhood, and share our memories. I know that as my granddaughters grow older and return for welcome visits, we will have many stories to share with them about 'the olden days'! Tokyo is a listener as his grandfather shares his tales of their small house and its beginnings, when nature was abundant, and how it has now been overshadowed by the many tall buildings that have been built around it. These stories resonate with Tokyo when he encounters an old woman on a bicycle, hauling a cart filled with dirt. "But when they got to the street, they saw that there was no ice-cream truck at all - just an old cart, pulled by an old bicycle, pedaled by an even older woman. The cart was not full of ice cream. It was full of dirt." The woman offers three seeds for planting, telling him they will grow whatever he wishes. Tokyo takes them home with him and shows his grandfather while they are having lunch. His grandfather advises that it is a good day for planting. 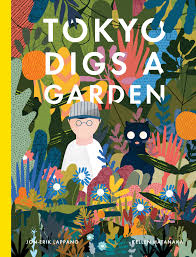 Tokyo plants them under a rock, makes a wish, and covers them with soil. The wait for results is almost instantaneous. Soon, the city has returned to its original splendor; that changes everything about the city itself and how it is inhabited now. What to do? Why not 'get used to it'? "Gardens have to grow somewhere, after all." The mixed media illustrations are brilliant. At first, the city is crowded with images of destruction and consumption - drab, colorless, lifeless. Grandfather longs for the abundance of the past. As the newly planted garden takes over, it becomes a warm display of color and humanity. Acceptance of the changes wrought brings busy life and contentment back to city streets. more than a sleeping world. life of a nighttime carnival ... "
I think we can all agree that we have been where Moon is ... wishing for something more than we have. Isn't it true that we often think things are much better for someone else, or somewhere else? There are many stories told of wishing for what we don't think we have or what we absolutely need. Such is the case for Moon. Moon aches to spend just one day as the Sun. Sun, being wise and patient, offers the trade that Moon seeks. The two conditions set out if they are to switch seem both harsh and full of purpose. If they change places for a day, there will be a reversal of roles. Moon will forever be the Sun. Prior to making that final decision, Moon must spend an entire night carefully considering all there is to be seen in the darkness. Moon agrees, knowing that nothing is likely to happen in the gloomy shadows of the night. If you think seriously about the many wonders you have experienced in the night, you will know that Moon is about to observe some pretty amazing scenes. What if there were no city lights, fireworks, starlight, night flowers blooming? "Across a quiet field he saw fireflies softly glowing as they drifted closer to him and the stars. He hadn't paid much attention to the stars before, but now they were all around him, so near he could even hear them smile." The wonders of both night and day are presented to young readers in this book that reads like a fable and has many of the elements of a folktale. Lindsey Yankey fills its pages with glorious double-page spreads that honor what is so special about each element of a full day. Filling her nighttime images with starlight and moonglow, she celebrates the true beauty to be found in Moon's world. You will want to take time to savor the color, the details and the joy she portrays. Share it in the daytime, or at bedtime, with someone you love. I find myself gravitating toward familiar characters, as I know so many young children do. There is comfort in knowing something about them. 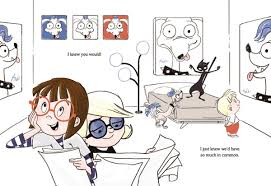 If they are as wholesome and charming as Louise and Art are, you cannot help but feel a kinship toward them. Their keen interest in their surroundings is evident from our first meeting. 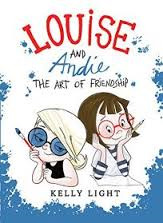 I hope you met them in Kelly Light's first book about this brother and sister pair - Louise Loves Art (Harper, 2014). If so, you will know Louise to be creative, thoughtful and imaginative. Art is eager to be with his big sister, and shares her enthusiasm for life. So, you will not be surprised that they are eager to say hello to a new girl in the neighborhood. They watch excitedly as the moving van pulls up and begins the unloading process. They don't even wait for the boxes to be taken in and unpacked. They hurriedly make their way over to introduce themselves, with high hopes that she is a kindred spirit. Andie is also an enthusiastic artist - her room is awash with portraits of her slightly goofy-looking dog, Bacon. Drawing together seems an appropriate next step! The day is perfect, until Andie wants to make some perceived changes to Louise's work. Louise is reticent to change what she has drawn, and does not agree. "I think we have artistic differences." Could it be the end to this budding relationship? The two could not be more different. Kelly Light shows those differences in carefully created cartoon images. The pets, the glasses, the clothing worn all speak to the issue they must confront, as they explore finding a common ground. Andie proves her mettle when she offers a shared piece of art and offers the hand of friendship once again. 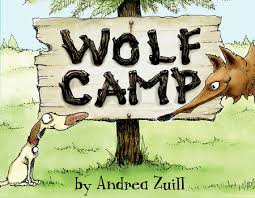 Although young readers may not understand the reference, the final scene is sure to delight the adults who share this charming story. kreck of frogs in the stream. listens for the footfall of the fox." Two young children, each on the opposite side of an oceanic panorama, settle for the night. As the sun sets in the east and makes its way west, the young boy sleeps in a bedroom awash with dimming light. The breeze blows softly through his window. He and his cat are companions in the growing darkness. His eyes are closed and he embraces a whiskered, furry sea otter to his chest. 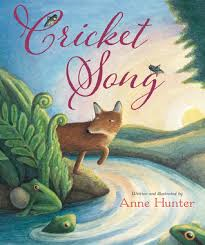 Crickets can be heard softly calling, along with other nocturnal stirrings. A peaceful scene runs along the bottom of the double page spread showing his house in fast fading light, and the ocean that separates his home from the sunny beach of a tropical setting. The sounds of the night are gentle and lead readers from animal to animal as they listen to the noises heard at dusk. As his beloved sea otters doze in the waters near his home, they hear whale song. 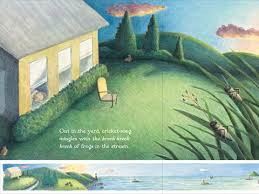 Those whales are warmed by the more tropical waters where the little girl is now also dozing, as the sun begins to set on her yard and her home, while she also listens to the crickets' song. 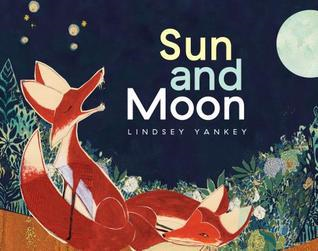 Lovely language and stunning artwork are sure to bring a halt to the pace of the day, as little ones settle in to hear this enchanting bedtime story. They are sure to be captivated by the many sounds that emanate from the peaceful surroundings. Using pen, ink and watercolor, Ms. Hunter portrays a night in shadow and the creatures whose presence is felt as both children slip into sleep. The panoramic borders effectively capture the shared experience of two children from diverse settings, showing that we have much in common no matter when we live. The changes from page to page are not dramatic, encouraging attention to the many small details as the sun moves west. What a beautiful invitation to sleep and dream! "Sheila held out a bag of jelly beans. Baby selected a yellow one. "Eugenia often says that jelly beans are bad for the teeth," said Baby. She put the jelly bean in her mouth. It tasted like sunshine. "Eugenia is not a fan of the jelly bean." "That doesn't surprise me," said Sheila. "Have another one." She held out the bag again. Baby selected a green jelly bean. It tasted like green leaves ... "
In this third book in the Deckawoo Drive series we meet the Lincoln sisters, Eugenia and Baby. They are elderly and have spent their lives with Eugenia (the older sister) being the 'boss' of Baby. It's difficult to believe it began when Baby was a baby and Eugenia refused to call her Lucille, her given name. "Your parents named you Baby?" baby, my baby.' And so I became Baby. Baby is having lovely dream about taking a journey when she is rudely awakened, once again, by her older sister with the terse reminder that 'goals must be set. Lists must be made. Tasks must be accomplished.' It's the final straw in a big box full of straws. Baby lays down the pencil she is using to scribe her sister's list when she announces that she is going on a journey. Baby knows it is an important decision, and necessary. Stella, the little girl who lives next door, has questions and the answers lead to her helping Baby make the first step in her journey. Stella takes Baby to the train station and help her buy the ticket that will take her to Fluxom. So begins a path to new learning and understanding for Baby. It is one of wonder - meeting with fellow passengers and talking about her life helps her discover who she really is - and joy. She tells people her given name, shares laughter, realizes that she loves comics, and that she has an affinity for small children and meeting their needs. 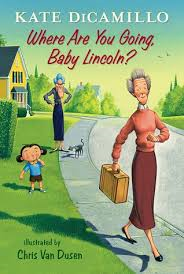 Kate DiCamillo's ability to tell a tender-hearted yet humorous tale is shown to perfection here. Imagine young readers as they discover Baby to be a grown (in fact older) woman who shares the same concerns and annoyances they feel at the hands and directions of their siblings. Perfection! "When a person bends over quickly and stands back up the sudden rush of blood to and from the brain can cause dizziness. Because giraffes grow as tall as houses, they have special blood vessels in their necks to stop this from happening ... 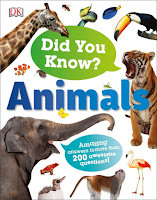 When the giraffe's head is down special valves in its blood vessels snap shut to stop blood from rushing downward ..."
It's another one of those brilliant books that children love to pore over, seeking information about animals that are familiar and those that are not. 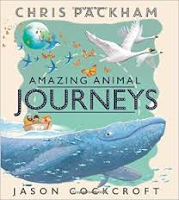 As I will tell you repeatedly, DK produces beautiful books that are a constant source of information and inspiration for children and their learning. "Why don't woodpeckers get a headache? Included on this double page spread is a clear and colorful photo of two woodpeckers doing exactly what they do to find food. As well, there are labelled captions describing more fully the skull, tail prop, claws and beak. An information box describes how a woodpecker finch and an aye-aye get their food from tree trunks. Never heard of an aye-aye? (You'll have to look it up.) A true and false section includes three statements asking readers to think back and provide an answer. There are five sections: mammals, birds, underwater, creepy-crawlies, and reptiles and amphibians. The final ten pages provide answers to the questions asked throughout, two pages of questions and answers you might use to trick your friends, a glossary and an index. Engaging and always accurate in those things that most intrigue a target audience, this is another terrific book from DK. Which bird builds the best nest? If you really want to know, you need this book. She stopped at the lights. The smell of the thief, and ... "
the book in the bed. the shoe in the shed. Nell does her work every week from Tuesday until Sunday which leaves a day of rest on Monday. Every Monday morning she goes to school with Peter. She listens to the children in Peter's class read to her. She loves it, and so did they! She does that until one Monday when Nell knows straightaway that something is amiss. The books are gone! There are clues. In her biggest challenge yet, Nell is off to find the much loved tomes, and to bring them home. It takes some time despite the speed of the chase. Kids will be in for a surprise when they learn who has the books and why. A further chase with a motive in mind - to show the thief the best place in the world to find books. And, it's free!! The double page that shows the interior of the library with its patrons and workers, its books and its spaces, and the joy to be found there is my favorite. Of course, it is! This would be a worthwhile book to share with little ones before taking their first trip of the new year to the school library. We are told that every year billions of animals migrate from one place on the planet to another. It wasn't long ago, in Jeannie Baker's masterful book Circle, that we learned about the bar-tailed godwit, an endangered bird from Australia and New Zealand, that migrates to Alaska and back every year. It is quite the story. In this lovely new book we learn about barn swallows, Bewick's swans, blackcaps, blue whales, Christmas Island red crabs, eels, free-tailed bats, golden jellyfish, leatherback turtles, monarch butterflies, pied wagtails, red deer, sardines, harbour seals and wildebeest. Sardines are small fish that travel in big numbers! caught in their nets, these fish have begun to disappear. Clearly this book is meant for young readers, and it is an fitting introduction. The text is just right for the target audience: understandable in its simplicity while also informative. It's just the right amount of detail to keep little ones interested and eager to know more. The accompanying artwork is quite beautiful, serene and warm while helping to add detail to the words. A world map shows where you might find the animals and their migratory routes. A back section titled Discover More adds expanded detail about each one. "Slaves sang work songs to keep in time with one another on jobs like hoisting a heavy beam or rowing a barge, and to lighten the drudgery of picking cotton under a blazing sun or harvesting rice in a sweltering paddy. Religious songs were part of every prayer meeting, promising a home in heaven as the reward for a lifetime of suffering. 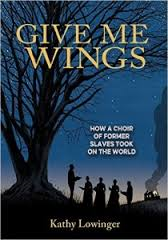 And in the rare happy times, there were joyful songs ... "
Kathy Lowinger did diligent research before penning this fascinating history of slavery in the United States. It opens at the time of the Civil War and takes readers through to the early twentieth century. It tells the story of Ella Sheppard and the Jubilee Singers and spotlights the role education plays in changing long held opinions and attitudes. The author has divided the story she tells into nine chapters, and opens each one with a pertinent quote that speaks to the chapter's main idea. The first chapter begins with a quote from Ella's mother. By telling the story through Ella's experiences and introducing readers to her mother Sarah, Ms. Lowinger explains the slave trade and the routes taken to bring slaves to North and South America. There are sidebars, a map, archival photos and artwork, and a carefully drawn accounting of Ella's early years. Each of the following eight chapters will help readers grasp the struggle that slaves faced in trying to make a better life for themselves - the right to education, freedom and change for all. The Sheppard family's struggle is clearly framed in context with all that is happening around them. Once the world at the time is clear and understood, we follow Ella as she enrols in Fisk University (then the Fisk Free Colored School) and, with determination and grit, begins to earn the education she craves. A threat that their school might close encourages a group of young people, once slaves, to form the Jubilee Singers and raise the funds needed to keep it open. Their program gained tremendous popularity when the began to sing the songs of their enslaved ancestors: today we call them spirituals. Their tour took the path of the Underground Railroad and they brought music to those who didn't know their stories, even singing for Queen Victoria on a European tour. They raised enough money to fund Jubilee Hall, which still stands on the Fisk campus in Nashville. By sharing this history through Ella's eyes and experiences readers have a clearer and more personal look at the many challenges of the time following the Civil War. The sidebars, paintings, postcards, included quotes, archival photos, posters and the inclusion of and explanation concerning some of the popular songs add context and will encourage interested readers to look for answers to their unanswered questions elsewhere. Back matter includes an afterword, a time line, a list for further reading and a comprehensive index. Still, the book feels like a story, and is never overwhelmed at any point by the historical details. Ella and her choir members worked extremely hard to have their story heard. Their success changed history in many ways by changing minds in a dynamic and entertaining way. "It wasn't long before Theo and Poppa were sketching a map. "This is where we are," said Poppa, marking an X on the page. "And this is where the streetcar goes," said Theo, drawing a long line from where they were to where they wanted to go." Poppa is a traveller, and a collector. Theo loves looking at the souvenirs he has garnered on all of his trips. It makes her want to be just like him. In thinking about that, Theo comes up with a great idea to celebrate his birthday. She will create a new trek she is sure he will love, and she will be with him for it. Together they make a grand plan, even designing a map of the journey they will take. 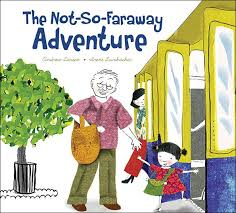 It includes the street car ride, some time at the beach, and a visit at the restaurant there. It's a carbon copy of the birthday celebrations he and Nana had shared when she was still alive. guarantee they are in exactly the right spot. The beauty of the beach makes it feel as if they are on one of Poppa's past trips. There's time to explore the soft sand, the shallow water and take some pictures before they make their way to the restaurant where they eat gazpacho, delicious and worth every last slurp. Poppa takes a picture of his granddaughter to add to his treasure trove at home. To say Theo is pleased is an understatement. Once home, there is another surprise and Theo has things of her own to add to Poppa's trunk. I have mentioned my admiration for Irene Luxbacher's mixed media artwork in other posts. It is rendered in Photoshop and the illustrations demonstrate the joy found in spending time together. The colors are rich, the pages filled with details sure to attract a child's attention and perhaps to encourage a try at creating collage for themselves. The trees are glorious, the hustle and bustle of the city evident, as is the peaceful quiet of time spent at the beach. Short trip or long, it's who you spend your time with that makes lasting memories. This is such a special story, and it will be much appreciated by all. You might want to remember it for September's celebration of Grandparent's Day. This is a gift to be savored. "In an attempt to soothe me, the Peacemaker asked me to sit with him and the Cayuga Council. He looked deep into my eyes and he spoke to the people. "I do not see defeat," he said. "What I see is a passage - a passage to a new way of life. Join me, and together we can spread peace rather than war, love rather than hate, unity rather than fear." Robbie Robertson dramatically retells in his own words, and David Shannon superbly illustrates the story of the creation of the Iroquois Confederacy by Hiawatha, leader of the Mohawk, and the legendary Great Peacemaker. Together, they unify the Five Nations - Mohawk, Seneca, Oneida, Cayuga and the Onondaga. It is a rich and emotional story, first heard by the author as a nine-year-old. 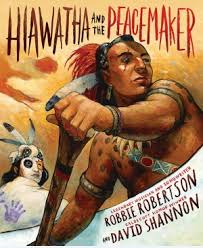 Mr. Robertson is of Mohawk and Cayuga ancestry and the story was told to him by an elder. It triggered an immediate response and has impacted him throughout his life. At the time he told his mother he wanted to tell stories, which he had done brilliantly in a long, productive career. himself as he struggles to deal with the vengeance he feels over the death of his family and to find healing in the peaceful message they spread. Robbie Robertson has written his tale to put it in a cultural context that changes what Longfellow's poem would have us believe. It shows that history can shape our place in the world and stories speak to our hearts. It is sad to think that it is still so relevant in today's society ... that we are still trying to find peaceful ways to live together on this earth. David Shannon paints in oils to visually depict the emotions and uncertainties that lead to a journey of peace and order. His bold palette and carefully drawn settings bring attention to the journey and the people who are part of the talks that lead to forgiveness and a wish to live a different life. He often changes perspective to allow readers to feel all the drama of the story being shared. Endnotes express the author's emotional connection to this story from his youth and the aboriginal oral tradition, and satisfies his need to share it. "Some years later in school, we were studying Henry Wadsworth Longfellow's poem about Hiawatha. I think I was the only one in the class who knew that Longfellow got Hiawatha mixed up with another Indian. I knew his poem was not about the real Hiawatha, whom I had learned about years ago, that day in the longhouse. I didn't say anything. I kept the truth to myself ... till now." An included CD is Mr. Robertson's musical version of the story. Where do people get their inspiration and imagination? If you know Cybele Young's previous works, you will not be surprised at the astonishing Japanese paper sculptures she has created for this book that stuns with its beauty and amazes with its creativity. She is a wonder! As she explains in her opening statement, we often lose things and can't find them anywhere. Do you ever consider what they may have become while lost? If not, take a look at each of the magnificent foldouts that fill this book. Each is described before turning to the foldout. LAST SEEN: Basement - obstacle course"
What follows is a glorious reconstruction of the lost object, retaining the color and connecting it to the original object while also having it become something never seen before. 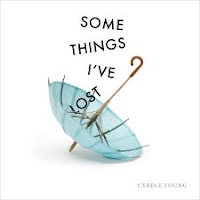 In page after page, Ms. Young astounds with the depth of her imagination and wonder, through a series of five changes that keep the original connected to what it becomes. There is a hint at an underwater theme - some of changed objects resemble coral, fish, jellyfish. Always surprising, demanding attention to detail, and remarkably creative. We do realize that 'anything is possible' when we see each of the new creatures sharing space on the final spread. North that are larger than any wolf you can imagine. Across the Arctic, and especially in Greenland, there live giant wolves called the amarujjuat." This is a great addition to the books that are being published by Inhabit Media. 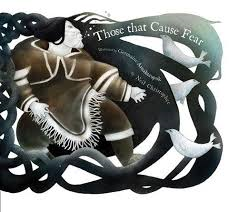 It introduces readers to many of the very scary creatures mentioned in Inuit myths and folklore. Neil Christopher begins with an introduction to Arctic Monsters. He explains that those things that are most scary about living in the Arctic are not the blizzards, the sea ice, or the huge animals that we associate with living there, rather this book is about 'things that go bump in the Arctic nights'. "An important thing to note is that some of the beings and creatures discussed in this book are said to have existed long ago and are no longer present in the world. 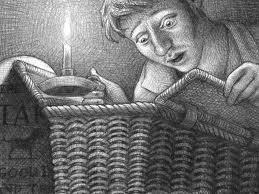 But many of them are thought to still be out on the land, hiding and waiting for an unsuspecting person ... "
He then goes on to introduce his readers to twenty monsters that are sure to frighten and intrigue. From the Amautalik to the Nanurluk, there is a full page description for creatures that are meant to strike fear in hearts and encourage caution when out on the land. Each has a facing page illustration depicting said monster. This allows readers to determine their level of fear when seeing them. "You will not find a travel guide or a map that will warn you of the hidden things contained in this book. For that information, you need to study Inuit oral history and talk to the people who have lived in the Arctic for generations." A pronunciation guide wraps it up and provides an invitation to practise your Inuktitut. "I just need to do something." "I will be half of a second." 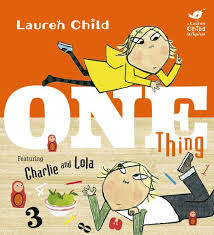 Getting to the store where Charlie and Lola will be able to choose ONE thing is tougher than you might think. Charlie needs time to brush his teeth, think about his forgotten breakfast, and even time to find the shoe that Lola needs before they can leave the house. When Charlie is ready, Lola is not! She is easily distracted from the task at hand, and uses up untold time thinking about the number of dots on her dress. On the way, she counts ladybugs and how many shoes those bugs might need. Then, there are the ducks at the pond. When she stops to share the few crumbs in her pocket, she attracts other birds as well. Lots of counting? Oh, yes! And number concepts galore. How much fun is that when wanting to up a little one's growing awareness for the world of numbers? Arrival at the store doesn't end the conversations. Now, Lola wants to bargain over what she is allowed to buy. Mom says one, Lola says three, Mom says one, Lola says two (as if she is willing to make a concession here) and Mom suggests NO thing at all. The deal is done, Lola and Charlie make their choices. The trip home is a lesson in subtraction as Lola uses her twelve stickers to decorate the neighborhood, her brother and herself. Charlie seems the perfect older brother. While he may feel annoyed with his little sister, he is ever patient and kind while expressing his frustration to us rather than to her. Text is scattered all over the book's pages, and the font changes constantly to encompass the mathematical language and concepts. Painted collage art is appealing and the characters charming. The author uses reds, greens and bright yellows to great effect. Readers will enjoy the humor, the relationship between the two siblings, and learn some math as an added bonus. I wish I had told you about this book ahead of Father's Day ... it's not always easy to find a book that is such fun, and such an homage to the dads who spend a great deal of time with their kids. In this one Dad is in charge for the day. He and the three little ones begin with breakfast. Then, needed errands are run before they head out 'to squeeze the day' in the wild. A rousing play on the seesaw and swings at the park tires Dad, if not the young 'uns. Dad provides for all manner of pretend activities, offering himself up as a raft for meandering and then a tree for climbing. They even get in a little trouble at times. A time of excitement while sharing a book is first on the agenda there, before taking the house apart to build a massive fort. The day is filled with fun; then it's time for bed. A dark and stormy night holds no fear when dad is near and ready for another story and a 'squeeze'. This dad is a master of all things enjoyable and playful. Brian Lies fills his spreads with details that are worth your time and attention. The love that is shared throughout the day is evident in every activity at every moment spent together. The art design constantly changes. There are spreads and spots, some have white space and others do not. Soak it all up, and take the time to talk about what listeners are noticing as the pages turn. Lots of heart, a healthy helping of humor and a book that kids will ask for again. 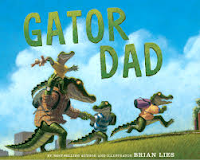 Brian Lies was a stay-at-home dad when his daughter was young. He shows us what fun it was for the two of them to spend their days together. "If you're ever in a carpet store, turn over a rug and look for the GoodWeave label. If you see one, you can be sure that no child slaves helped make the rug. You have Nina Smith to thank for that. Smith, the executive director of GoodWeave International and the force behind the label, wants to end child slavery in the handmade rug and carpet industry ... "
This book is beautifully designed, with full chapters about 14 women who have taken noteworthy action to make a difference in the world. For more than two hundred years women have been working to bring an end to slavery. Some included here are celebrated, while others are less well known. All have made a tremendous impact fighting slavery in its many guises. Each chapter presents a captioned photograph of the woman presented, and is faced with a personal quote. Most are American or British, although Timea Nagy's story takes place mostly in Canada. I like that it is chronological, beginning with Elizabeth Freeman in a Massachusetts courtroom in 1781. She fought for her freedom from slavery, was granted it through a court proceeding, and went on to care for the Sedgwick family for many years. It was the first time that a slave sued for her freedom citing that slavery was illegal in her state. Thus, slavery ended in Massachusetts. She, along with the other women chronicled here, inspired the two authors to do their research and write a book about women who dare to fight for what is right and just. The book ends telling Nina Smith's quest to keep young children from slavery in the rug and carpet industry. 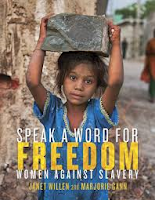 The numbers of children in slavery in South Asia have steadily declined because of her actions. In reading these chapters we gain a much more comprehensive understanding of the many ways that people around the world are enslaved. We can only hope that it serves to encourage others to broaden their knowledge and join the fight to make living conditions for many much better than they now are. It is a global view and will open eyes to much that we do not know. They are heartbreaking and hopeful, presented in a way that encourages readers to think deeply and clearly about how they might help. It is a companion book to one previously written by the two authors, Five Thousand Years of Slavery (Tundra, 2011) and narrows the focus to celebrate the bravery and persistence of a small number of women willing to fight for what they believe right. It is a tribute to their fight, and honors their contributions. Back matter includes websites, selected sources for each one of the chapters, photo credits, acknowledgements, and an index. "One of the most important actions for young abolitionists today, as it was for abolitionists of yesterday, is to spread the word. Let people know that slavery still exists." Books like this provide an impetus to all people to get out there and make a difference ... in whatever way we can. "Rowan looked over at Papa's cat, Fritz. Cats are boring, he thought. Still, he knew how to be polite. "So what did you do?" "Red and I rushed to the scene!" "Red's ladder reached all the way up - and we that scared cat down. Poor thing kicked and clawed ... "
Rowan has a very special wish for his birthday: a brand new, shiny red fire truck. Is that what he gets? No, it is not! 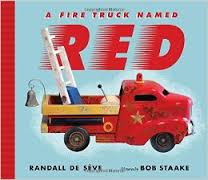 Instead, he gets Red, a fire truck whose exterior exhibits a lot of wear and tear. It has scratches and rust spots, an old broken ladder, worn tires and a decidedly old-fashioned feel - nothing like the streamlined, brand new engine with the $99 price tag in the toy store window. Red is the fire truck his grandfather had when he was a child. Papa is convinced they can bring Red back to his glory days. As they work, Papa relates childhood memories of the adventures that he and Red shared. Rowan is not easy to convince. Bob Staake creates those memories in sepia tones and fills the movie-like images with action, expression and a good deal of excitement. Papa ensures that each new adventure will grab Rowan's attention. Rowan can't help himself: he is transported back in time to when Papa and Red were heroes for a cat, elephants, and a fire at the library (the cause of the peeled paint on Red's hood). As the excitement of Papa's story builds, so does Rowan's willingness to help bring Red back to glory, and even to play a role in the final act of Papa's tale. Teamwork, memories and love of family make this a stand-out book for story time reading with young children. Add it to your list of books to be read leading up to Grandparent's Day in September. It might just have little ones asking their nanas and papas about times past. If Pan were as mischievous as the prolific Mordicai Gerstein describes him in this homage to one of the most notable Greek gods, then this book is perfect fare for the young children who will love to hear his story. 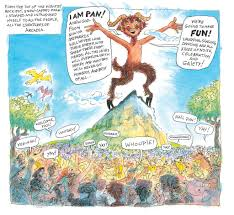 Pan is very much like them ... childish and full of fun! He may be noisy, but his heart is in exactly the right place. He wreaks havoc wherever he goes throughout his lifetime ... never losing his zest for life and tomfoolery. As he ages, the gods become less enamored of his behaviors and ask him to make his way to Arcadia where there will be much to keep him busy and occupied. There is so much to do there, and he does it with great gusto. His tale is told in quickly read chapters, fashioned with cartoon-like panels that take readers from one special event to the next. His first person voice is fresh and telling, garnering feelings of warmth and admiration as he goes about annoying and delighting both gods and humans. He is larger than life, and we are along for the ride that is that life he leads. 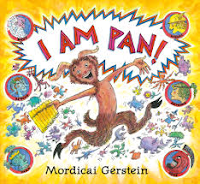 The book is great fun to read aloud, and will have young children chuckling as they listen to Pan's voice explaining the many happenings in his life. 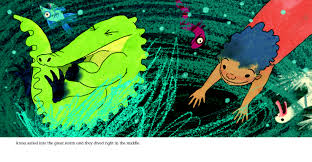 The book is filled with action and movement, and bold, beautiful color - all those things that will attract attention and make for a memorable story. It is a terrific introduction to Greek mythology for kids. "Hans quickly formed friendships with several of his fellow soldier-students, members of the army medical corps. They were drawn together by their shared enthusiasm for books and music and by their opposition o the Nazi regime, which they dared discuss only among themselves." 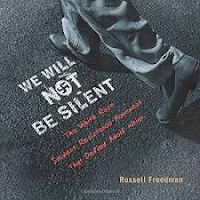 I so admire the work that Russell Freedman does to bring the importance of history to young readers. In his latest book, he shares the story of the White Rose resistance that was initiated by a group of university students in Germany in 1942. Adolph Hitler and those who worked with him continued to repress the lives and movements of the German people. Hans and Sophie Scholl's growing discontent with the way they were being treated as members of the Hitler Youth groups led them to take a stand. Many of their young university friends needed little encouragement to join the White Rose Movement and to help them distribute the pamphlets they wrote concerning Hitler and the Nazis. The Nazis were not about to be one-upped, and worked tirelessly to find who was responsible for the printed words that urged their countrymen to denounce the evil that was at the heart of Hitler's government and policies. The students knew that they were risking their lives; if caught, they would surely be sentenced to death for their treasonous ways. They continued on. They printed their pamphlets in secret and distributed them in various ways. What began in June 1942 led to six handouts being written and distributed throughout Germany. Their arrest the following February was followed by a quick trial and execution by guillotine for the siblings. The personal and other archival photos included throughout the text are important and telling, as are the source notes, selected bibliography and index. Pair this book with The Boys Who Challenged Hitler by Phillip Hoose (Farrar Straus Giroux, 2015). "Caitlin especially enjoyed watching elephant families interact at the waterhole, where they'd gather during the hot, dry days. 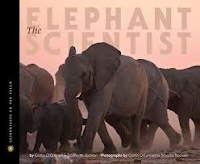 "Most elephants grow up with a mother and a grandmother, a few aunts, a couple of sisters, a brother or two ... "
This paperback edition of the above title introduces readers to Caitlin O'Connell and her team of scientists who have strengthened our understanding of and admiration for elephants. It shows readers just exactly what research in action looks like. That research has put the spotlight on ways these majestic animals communicate with one another. By showing her readers how she set up the research program that began with observations and questions, she helps them understand that learning one thing often leads to more questions, and further learning. She includes a detailed study of the cells that comprise an elephant's foot and trunk in an attempt to discover the ways they use ground vibrations to make decisions, to protect and to pass messages from one herd to another. In fact, the team used a variety of sounds to see the effect they would have on the studied herd. Elephants were being killed in a fight to keep them out of farmer's crops, as they were destroying everything the farmer needed to sustain the family. Caitlin wondered if, by learning more about the ways these gentle beasts passed messages, they might be able to send their own messages to keep the herds away from those fields. As is common in the Scientists in the Field series, this research report from Namibia is accompanied by brilliant color photographs with informative captions, and provide interested readers with a close look at the elder elephants as they care for their young and wander the lands these elephants call home. The research camp is amazing to see! Along with a list for further reading, a glossary, selected source notes, and an index, we are invited to visit http://www.utopiascientific.org. It is a website set up to show us ways to ensure that elephants thrive and survive in the wild. "Over at the Amazing Cheese Dairy Farm, Isaac is training his new worker, Rachael. He hands her a clipboard. "These are the directions for making cheese," he tells her. "Remember to put a check mark after you finish each step. And very important - don't miss any steps." It's market season! Lucky we are to be able to visit local farmer's markets to buy luscious vegetables, grass-fed meat, raw honey, and other lovely baking, etc. 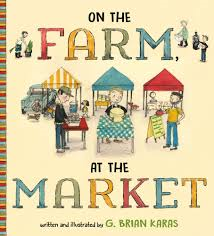 In this book, children learn what happens ahead of those farmers being able to bring their wares to market. Three different farmers share their experiences as they get ready to set up the following morning. Leo owns a vegetable farm and is busy showing his workers which ones to pick first. They will then be ready for washing, and to be packed later onto trucks. Others will be picked just prior to departure for the market in the morning. They are long busy days for Leo and his team. Isaac, at the cheese dairy farm is showing Rachael how to make cheese. Given instructions, Rachael is ready to follow them to the letter, checking off each step in the process. Other workers are making sure that the right cheeses get packed for the morning trek to the market. Gary grows mushrooms in a room where the air is kept cool and misty. Readers learn just exactly how mushrooms are grown and prepared for sale. On Sunday mornings, the sellers prepare their market space and wait for customers. Eager buyers come from near and far, all delighted to reap the benefits of the hard work that has been done to bring so much goodness. There are long lines of people who listen to music, visit, and fill their carts, bags, backpacks with their purchases. And then - it's time to clean up the space and finish the day at the Busy Bee where Amy, the owner, has created 'Amy's special Market Pie'. It's a real treat! Brian Karas uses gouache, acrylic and pencil to share images of the diverse group of people that make the market a successful venture. It is a spirited community shown in lovely double page spreads and assorted spot pictures to give readers a feel for the work and camaraderie so much enjoyed. His author's note summarizes the work done to provide us with such bounty. Bravo to our local farmers! "If only he had run away with Blink when he'd had the chance, then he wouldn't be standing here alone and freezing. The hazy blue light made Joseph think of the nights the two of them would sneak off to some empty room at school, light a candle, and read out loud to each other from one of Blink's books. They'd quickly get caught up in the adventures of characters with names like Pip and Mowgli and Prince Caspian." How does he do it? 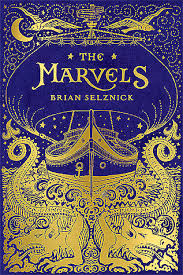 Admiring Brian Selznick's work is simple - you just have to look carefully at the first few pages and you are drawn in, not minding that you are holding a very hefty book of 665 pages! The only thing is that I cannot read it in bed at night for fear that it will break my nose when I fall asleep and drop it! Once started, there was little sleep until it was done! It is so beautifully conceived that I am still in awe and thinking about it a week after finishing reading it. The story begins in 1766 on a ship. In four hundred pages of absolutely glorious pencil drawings - almost wordless - we learn the story of a shipwreck, the death of a beloved brother, an angel, an abandoned baby and five generations of an acting family called The Marvels. They are actors in London, the place where the lone survivor of the shipwreck finds himself, alone and looking for someone to call his family. Billy is taken in by the people at the Royal Theatre, a place he knew about from his time on the ship. There, he works and grows up, eventually taking in an abandoned child left on the theatre's doorstep. So begins an acting dynasty, until Leo decides that acting is not his destiny. He chooses the sea. A startling event at the end of the illustrated work leaves the audience aghast. A turn of the page jumps the book forward to 1990, the written text , and a boy named Joseph Jervis. He is on the run from his boarding school. His parents are on an extended trip. He is on a quest to find his mother's brother, his uncle Albert Nightingale. Just as Billy longed for a family connection, so does Joseph. He hopes he will find his uncle and seek refuge with him. As he looks in the windows of an elegant house, he can see that it is very old-fashioned. Thus, begins our mystery. Uncle Albert is not keen to have a house guest and does his best to discourage Joseph. But, he does take him in and allow him to stay ... just for the night. 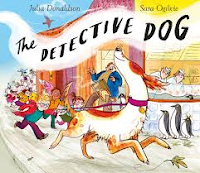 Joseph is intrigued by the house that looks like a family lives there, when there is only one person - his uncle. Every day the house looks exactly the same, and Joseph is intrigued by the pictures, the sounds, the state of the house and his uncle. They seem locked in a time long ago. With the help of a young neighbor girl he meets when he arrives, the mystery comes undone. Eventually Arthur shares the facts that have led him to live as he does. The two reach an understanding. Can it be that they have each found a family in each other? "Much of this book is based loosely on the lives of two real people, Dennis Severs and David Milne. Dennis Severs created what is known today as Dennis Severs' House, at 18 Folgate Street, in London, England (www.dennissevershouse.co.uk). It is consistently voted among one of London's most popular and unforgettable tourist attractions." Through his close friendship with the curator of the house, David Milne, the author learned much about Dennis Severs and that was the impetus to create this magnificent book. How does that happen? He wanted to be a hero. 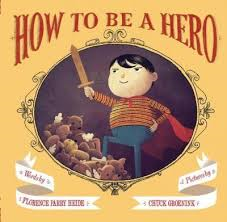 For kids who know fairy tales and dream of being heroic, this is a book that will appeal to their funny bone and their understanding of what it takes to be a hero. The endpapers give us a hint at some of those heroic exploits. A first glance at our would-be hero shows him from a bird's-eye view, sitting on a brick patio and reading a book. Little expression, red cape intact and wearing a sad countenance, it take a page turn to give a little more information. No one in his house shows expression: his mom and dad are reading their material of choice, paying little attention to his presence. parents and lots of toys. Or is it? Gideon wants to be a hero, and he thinks he knows what it takes. Quick summaries of those fairy tales that evoke heroism are shared. He wonders if he might need all the skills exhibited by those heroes. Kissing doesn't seem his best option. Perhaps it's being in the right place at the right time! The daring scene that plays out behind him in the supermarket as he buys a candy bar really has nothing to do with why Gideon is celebrated when he gets to the checkout. He is, however, pleased with his notoriety and is convinced that he is entirely right about being in the right place at the right time. Reading this book is a special treat; it is written with limited text to follow Gideon's thinking. The illustrations tell the rest of the story perfectly. There is so much more to what is happening than what Gideon is discussing. Therein lies the true joy to be found in the tale! Note every detail, and don't miss the fun that comes from the signage on the commercial street that houses the supermarket where Gideon becomes the hero he so wants to be! "Arthur looked around the small, two-bedroom apartment in Baku, Azerbaijan, in disbelief. This can't be our new home, he thought, a lump in his throat. There was no yard to play in. There were no fruit trees to climb. He suddenly missed his home in Chechnya very badly. He closed his eyes and saw his happy bedroom, painted blue like the sky, and his toy trucks ... "
As we look forward to the opening of the Summer Olympics I wanted to share this story of one of our young athletes, whose journey has been a most difficult one. 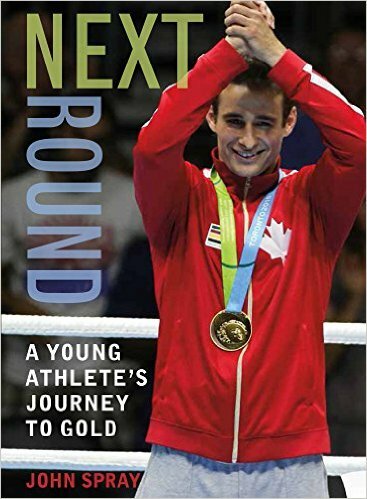 John Spray writes the story of the Chechen Wolf, a young Muslim refugee from Chechnya, whose grit and determination won him a gold medal in the 2015 Pan Am Games as a member of Canada's boxing team. It was Canada's first gold medal in boxing in forty years. In interviews with Arthur Biyarslanov, Mr. Spray heard stories of his early life, their escape from Russia, the family's life in a refugee camp in Azerbaijan, and finally a new life in Canada ... all before he was nine years old. "Arthur knew that he had to leave most of his things behind when this family left for Canada, so he invited all his friends over and gave them his Pokémon cards and all of his toys. His friends were really happy with the unexpected gifts. They shook Arthur's hand, patted him on the back, and wished him luck in Canada. "When you're a famous soccer player," the goalie said, with tears in his eyes, "don't forget your old mates. You get to the World Cup or something, make sure we get tickets." Arthur promised he'd never forget his little gang of friends, and with a lump in his throat, said good-bye to all his chums." The road from then to now, in 2016, was filled with sports of all kinds including soccer, a badly broken leg and a switch to trying his hand at boxing. His skills improved tremendously when he started working with Danny Santagato, who became coach, family friend, mentor and father figure. "Arthur continued to fight and win tournaments throughout 2008 and entered grade eight on a real high. He was now an upperclassman in middle school and played in the city finals in basketball, volleyball and soccer. On the track team he made the city finals in the shotput, the 800 m run, and 4 x 100 relay. He helped bring to Winchester Senior School six championship banners - the most in the school's history." boxing team. What a feat! Not one member of my family or friends will believe me when I say that I am going to keep my eye out for boxing matches during the Olympic coverage, but I will be ... and that is the truth! "It doesn't have an X,"
Friendship and imagination are the mix for this tale about an intrepid young girl and her crocodile companion. They want to find gold, and know it will take a plan to make it happen. 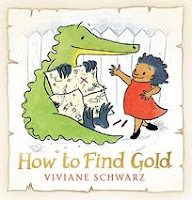 Crocodile fears that the search might be filled with peril; if so, Anna will be overjoyed. like a tower and the fish are in the air?" "A great storm!" said Anna. "There will be gold!" They face down the storm, dive right into the sea, discover gold, and then make an alternate plan! 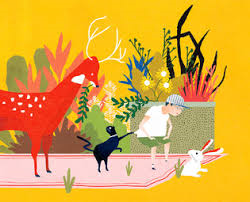 I love the mix of styles that Ms. Schwarz uses to create these charming illustrations. 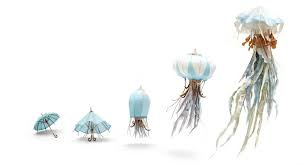 She uses pencil, crayon and watercolor to design the amazing world that exists in Anna's imagination. Red (Anna's dress) and green (Crocodile's skin) keep our focus in the right place throughout. Imagination spawns full color spreads filled with action and adventure. Kids love treasure and the hunt for it. They will want to hear Anna's story more than one time. Each time it is shared, they are sure to find something new on its pages. It's a grand sea-faring adventure! Then one day I got a surprise. All Homer can think about doing is attending WOLF CAMP. I mean, what self-respecting dog wouldn't want to live like a wolf for a whole seven days? He nags and nags to be allowed to attend, and have his dream come true. Given the OK, he is off! His first introductions are to Fang and Grrr, beasty counsellors in the art of being wolfish. Homer takes in all instructions, meets some new pals, Rex and Pixie. Together, they make up a pack and do their learning: howling, hunting, and sleeping in the great outdoors. There are some normal camp issues regarding food quality and the bugs that plague him; still, Homer is reluctant to say goodbye when the week comes to an end. Of course, returning home has its rewards - a comfy bed, a warm blanket. Being made an honorary wolf, with a certificate of authenticity and an accompanying realistic howl, makes the week worthwhile. Kids are going to hoot as they pore over the watercolor illustrations that give expression and life to these canine characters. My favorite double page spread shows the three campers raptly listening to Fang's long-winded diatribe on safety issues. It goes on until it literally fades off the page. Funny! From chasing a squirrel together to gaining enough confidence for Pixie to think she can 'take' a moose, it's laugh out loud hijinks. Might even occasion a softer feeling for those wolves that seem destined to terrorize us. I wish that every family standing in a security line at any airport in the world had read this book before leaving, or had it to read while waiting. 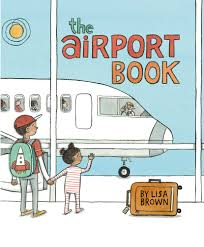 It is a wonder, and such an accurate, informative portrayal of almost any airport you have ever visited. In second-person voice, Lisa Brown describes the airport experience for many, even though she focuses our attention on one family. It begins with their trip from home to the airport in a taxi; they are then offloaded at the curb, and make their way to their first line. If you can manage to follow this one family through their travel experience, from start to finish, I will be astounded! There are so many things to distract you ... and they provide such entertainment. 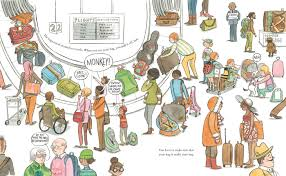 EVERY double-page spread is replete with information about airports, about travel, about other people and families who are sharing similar experiences. There are so many stories to follow and I found it impossible to do all at once. My advice, after spending a good deal of time with this exceptional book, is to focus on one story at a time. That way, you are unlikely to miss the dry humor, the angst, the fun and the everyday experiences of those who choose to travel by plane. Be sure that you don't miss the endpapers; they tell their own part of the story. You are destined to read it again, and then again! Ms. Brown's realistic ink and watercolor artwork places the reader in the midst of the family's trip and all that it entails. If you have ever travelled with your family, you will recognize yourselves in its pages. If not, you need to have this book to revisit every aspect of your trip when you arrive at your final destination, or once you are back home again. I love the many brilliant details, the plotting and the clear and valuable information shared. It is destined for my 'keeper' shelf; of that, there is no doubt! It's pretty exciting! This morning when I went out to water the three tomato plants I have on my patio, there are two ripe ones. I am going to leave them there until Sicily gets here. She is almost 2, and loves to pick tomatoes ... and eat them. They are the yellow cherry kind. 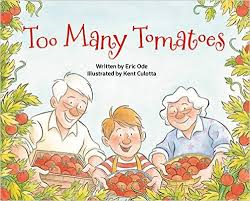 I wonder if you can ever have too many tomatoes. It's such a short season here, I will enjoy them every day for as long as I have them. In this story, kids get a close look at the garden through the eyes of a young boy and his grandparents. He's there to help and it's hard to believe just how many tomatoes are hanging from every plant. How is it possible that one packet of seeds could produce such bounty? Seems that not one seed was wasted. and one for the tailor. and one for the plumber. and one for the drummer." It doesn't end there. Lucky recipients of such deliciousness! It makes my mouth water for some of my own. The family does remember to keep some for themselves. The story's rhyme adds to the fun, and the zippy feeling that people get when sharing with others, and from growing their own food. Kent Culotta matches the buoyant tone with his colorful illustrations and happy expressive faces. If you love tomatoes, you will want to share this book at home or at school. It's fun to read out loud!